Wind farms are now going further and deeper offshore. Three pioneering projects in Scotland – Hywind, Beatrice, and Neart na Gaoithe – are showing the way. In October an innovative project and a world first, the 30 MW Hywind floating wind farm 25 km off the coast of Scotland, started producing electricity and delivering it to the grid.The £210 million array at Buchan Deep, near Peterhead, believed to be the first commercial facility of its kind, was officially opened by Scotland’s first minister, Nicola Sturgeon, and has been hailed as a major step forward in the commercial development of floating offshore wind technology. The wind farm, which has the character of a pilot, a trial of the floating configuration in deep water, consists of five 6 MW Siemens Gamesa turbines mounted on Navantia floating spar foundations. Owners Statoil and Masdar are also planning to add to the project with a 1 MWh lithium-ion battery energy storage facility. The Hywind array covers an area of around 4 sq km in water depths of 95-129 metres off the northeast coast of Scotland, 30 km from Peterhead. Statoil is expecting to see a dramatic reduction in the costs of floating offshore wind in the next few decades. “Statoil has an ambition to reduce the costs of energy from the Hywind floating wind farm to €40-60/MWh by 2030. Knowing that up to 80 % of the offshore wind resources are in deep waters (60 m+) where traditional fixed seabed foundation installations are not suitable, floating offshore wind is expected to play a significant role in the growth of offshore wind going forward,” said Rummelhoff. Industry experts point to the opportunities for floating wind to follow the same cost reduction trajectory as fixed offshore wind. 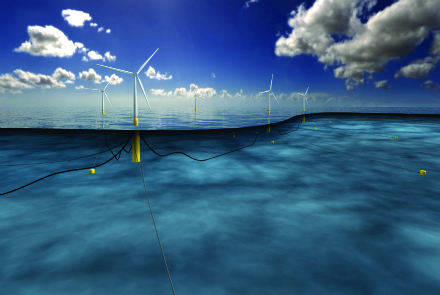 It can share in the technology advances made in the wider offshore wind sector. Cost savings from assembling turbines onshore before towing out to sea, and the use of lower cost vessels, also offer cost reduction opportunities. Using floating platforms means being able to position turbines further from shore in areas of greater wind resource. Dounreay Tri is a 2x5MW floating wind project, still in the planning stages, being developed by owner Hexicon AB. It will be mounted on a Hexicon semi-submersible platform located 7-10 km from shore near Dounreay in NE Scotland. Kincardine Offshore Wind Ltd is a project developer formed by PORL and Atkins to develop a floating demo array using 8x6.15 MW Senvion turbines on a Cobra floating semi-spar substructure at a location about 15 km off Peterhead, Scotland. It has been consented, and casting of the first concrete caisson was scheduled for August 2017.